Liverpool have rewarded defender Tom Clayton for his fine form with his first professional contract at the club. 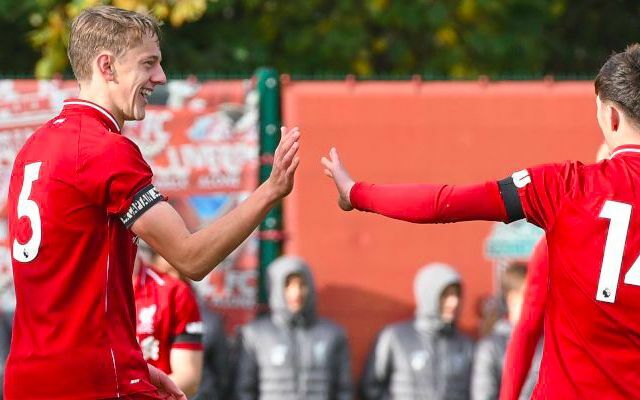 The teenager, who joined the Reds’ academy at U9 level, was handed his U18s debut by then-manager Steven Gerrard during the 2017/2018 campaign. He managed 19 appearances across all competitions that season, starting and playing the full 90 minutes in 15 league outings. Having retained his prominent role under head coach Barry Lewtas, who replaced Gerrard in the summer, Clayton has recorded 14 appearances across all formats this term. This included wearing the captain’s armband during September’s 4-1 win over Newcastle amid the team’s rise to the top of the U18 Premier League table. A bright impression at club level has also translated onto the international stage, with Clayton earning his debut for Scotland’s U19s in September’s 4-3 defeat to Poland. This was followed up by his involvement in November’s EURO U19 Championship Qualifiers against San Marino and Sweden, respectively. Clayton took to Twitter to announce his news. Good news for Clayton has, however, been cruelly tainted by a recent foot injury that will require season-ending surgery, according to Goal’s Neil Jones. Liverpool also recently awarded a first professional contract to talented 17-year-old right-back Neco Williams, who has featured predominantly for Neil Critchley’s U23s this season. The club has meanwhile added to its youth ranks with the signing of 16-year-old French defender Billy Koumetio from US Orleans Loiret. We wish Clayton all the best in his recovery.